This morning the government published the latest estimates for trade union membership in the UK, they make for grim – but important – reading for anyone in favour of a healthy union movement. Here are 5 key points to take away from the statistics. There are now just 6.5 million people who are members of trade unions in the UK. This is down from 7 million at the start of this decade, and from a peak of 13 million in 1979. The fall in membership over the course of 2016 is the biggest annual decline since comparable records began in 1995. With membership among employees falling by 275,000, overall membership was down by slightly less (around 250,000) because of a slight up-tick in the number of self-employed people in trade union membership. Although this growth is, in part, a product of the surge in self-employment we saw over the course of 2016. Trade union density measures the proportion of employees (or all those in employment) that are union members – it provides a better estimate of the overall strength of the labour movement in the UK than the headline number of members. On this metric, unions have slipped back considerably in the past year. 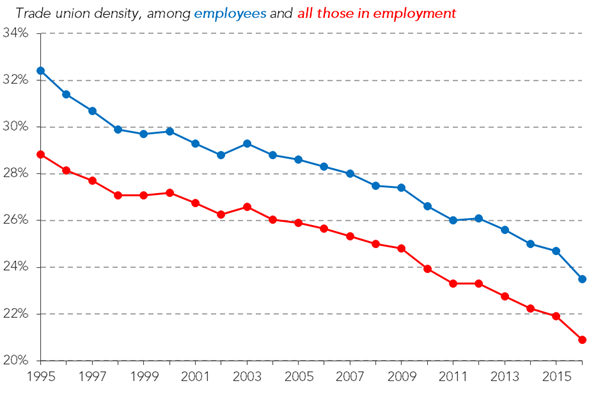 With trade union density falling by around 1 percentage point among employees, and all of those in employment. This is the largest fall that we’ve seen since 1995 and it means that trade union density has declined by more than a fifth since the turn of the century. Trade union members are heavily concentrated in the public sector. More than half of public sector employees are trade union members, compared to just 13 per cent of employees in the private sector and 7 per cent of the self-employed. 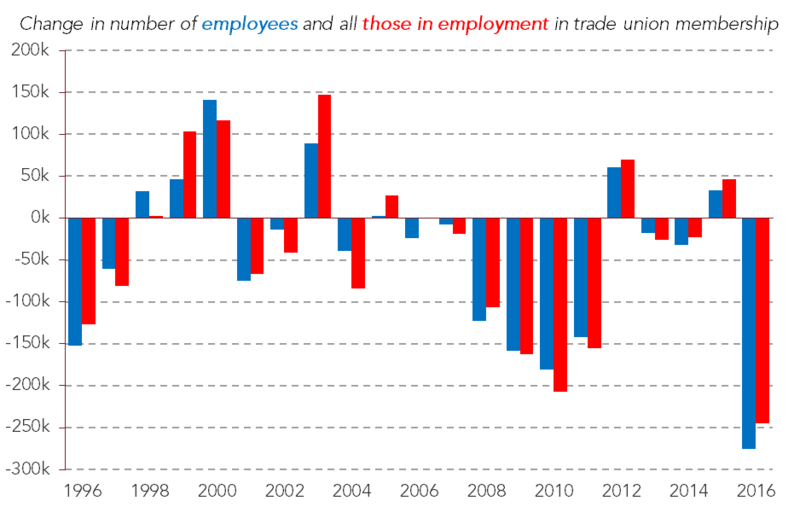 This year, trade union membership has continued to fall among private sector employees – from 13.9 per cent to 13.4 per cent – continuing the story of a long, slow, decline in union density in the private sector. It is encouraging to see an increase in union density among the self-employed, but the very small sample size here means that it wouldn’t be wise to draw any firm conclusions. What is clear to see, however, is the striking fall in membership rates in the public sector. Here membership has declined by over 200,000 in just one year. The key driver of this fall is a sharp decline in the number of people working in education that are trade union members. In 2015, 58 per cent of public sector workers in education were in membership, and in 2016 this had fallen to 54 per cent. Overall, the numbers show that membership has fallen by 155,000 in education since 2015 – this one sector alone accounts for over half of the fall in trade union membership over the past year. What exactly has happened here isn’t totally clear; have unionised teachers been retiring at a fast rate as new recruits to the sector haven’t been signing up? Is this a sign of things to come in the education sector, or is it just a one off blip related to the recent move towards academisation? Things may become clearer later this year when the teaching unions publish their own statistics on membership levels in 2016. Overall, despite big falls in membership in the public sector, the distribution of union membership across the population has remained largely unchanged over the past year. 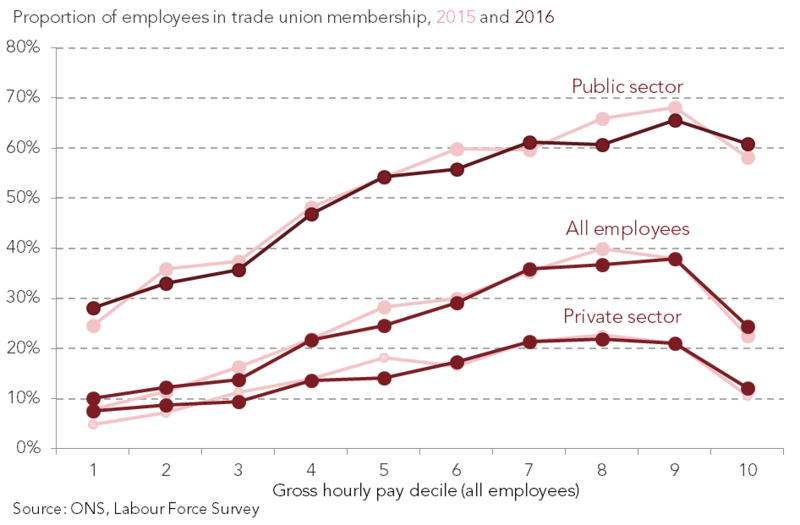 It is still the case that you are significantly more likely to be a trade union member in higher-paid public sector roles (where membership is above 60 per cent), than lower-paid private sector roles (where membership is below 10 per cent). Membership rates are 8 times higher for those on high earnings in the public sector, than those on the lowest earnings in the private sector. Unions, sadly, are still weakest where they are needed most. Last year, we published estimates for where trade union membership would be in 15 years’ time if the trends over the first five years of this decade continued into the future. Today, we have revised that projection in light of figures for 2016 and it has deteriorated accordingly: if the past is a good guide to the future, trade union membership will be under 17 per cent by the end of the 2020s. Without an embracing of new ways of working and finding new organisations to work with, trade unions might may well end up being a 20th century aberration.